Welcome to Season 8, Episode 12 of the This Is Your Life podcast. 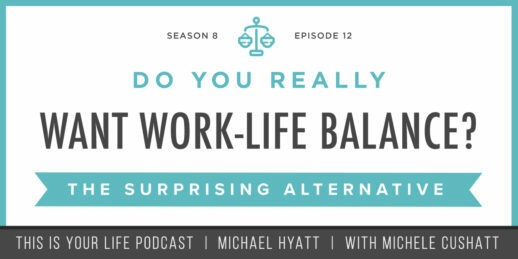 In this episode, Michele Cushatt and I discuss the surprising alternative to achieving work-life balance. There are more demands on our time and attention than ever before. Is it even possible to be successful in both your professional and personal life? I think so. In today’s podcast, we give you five suggestions for aligning your home and work life with your highest values. NOTE: We are not recording a video version of the podcast this season. Enjoy the audio or subscribe to the podcast above. How to get crystal clear on your priorities. The appointments that you probably aren’t setting but should be. Key steps to aligning your practice with your priorities. How to determine your non-negotiables and give them first place in your schedule. “ Work-life balance is not a problem to solve; it’s a tension to manage. You can download a complete, word-for-word transcript of this episode here, courtesy of Ginger Schell, a professional transcriptionist, who does all my transcriptions. Question: What changes are you going to make this week to make sure your weekly activities are in alignment with your priorities? You can leave a comment by clicking here. Your Total Productivity Makeover -FREE video series designed to help you achieve more by doing less. Registration will only be open through September 18, 2016, so register now! Inspired Life -Michele’s mastermind group for women in business. Michael Hyatt is the author of the New York Times, Wall Street Journal, and USA Today bestseller, Platform: Get Noticed in a Noisy World. Recognized by magazines like Forbes and Inc as an important online marketing and leadership expert, he’s also the founder of Platform University and 5 Days to Your Best Year Ever. Read more about him here. Michele Cushatt is a popular speaker and author. Follow her on Facebook, Twitter, or her blog. She’s a three-time cancer survivor with a powerful, personal story. Listen to it here or read about it in her memoir, Undone: A Story of Making Peace with an Imperfect Life.